The versatile design of the Blackhawk! 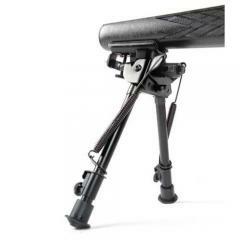 Adjustable Bi-Pod integrates the latest mechanics in horizontal traverse and pivoting options. Whether on the range or in the field, the adjustable pivot feature provides a level shooting platform regardless of the terrain. The horizontal traverse element allows users to pan smoothly from left to right with the firearm, ideal for switching between targets or for tracking a moving target. Adjusting for heights from 14 to 29 inches, the durable all-metal construction bi-pod mounts securely to firearms with a sling swivel stud. Blackhawk! 's Bi-pod combines functionality with astute engineering, making this a must-have tactical accessory.